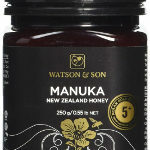 Watson & Son 5+ Manuka Honey makes a great everyday honey and has been certified in an independent lab. 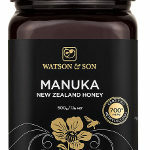 Watson & Son are a father and son team who make world-renowned manuka honey. This is a certified manuka honey using the Molan Gold Standard scheme, and makes a great honey to try if you are new to manuka honey. 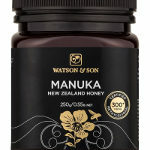 This certified manuka honey is a good one to try if you are new to manuka honey and its deliciously aromatic taste. 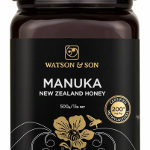 Watson & Son are one of the most respected names in the manuka honey business. 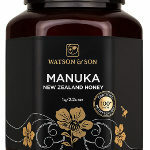 Watson & Son 18+ MGS Manuka Honey is a very pure and rare specimen! The honey is verified as having an MGO level of 700+ and is tested using the Molan Gold Standard certification scheme. This is a gift of nature at its most powerful. Try it and see for yourself. A certified manuka honey MGS 8+, which corresponds to an MGO level of 200+. 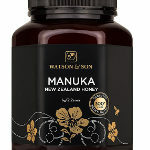 A delicious manuka honey from one of New Zealand's best known and respected producers.